Miller's Honey is the preferred honey that has been the Utah Standard for 117 years. Nephi Miller started his honey business in Providence, Utah in 1894. With the help of his pioneer father, Nephi exchanged five bags of oats for seven colonies of bees. This was the beginning of Miller's Honey Company. We are still family owned and we still provide the same 100% Pure and Natural Honey Nephi produced then. Our honey comes from the rich clover fields in the Rocky Mountains of Utah, Idaho, Wyoming, Montana, Colorado and North and South Dakota. Always the best of the crop, and always the best flavor - raw, unfiltered, uncooked. All of the natural nutrition stays in the honey. Miller's Honey is strained, not filtered, which means you get some of the purest honey available anywhere. Our Creamy honey is the same honey with nothing added. 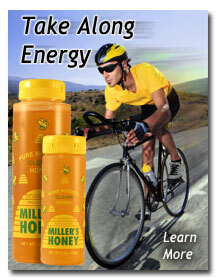 Look for Miller's Honey with our distinctive Yellow and Green Labels. Miller's Clover Honey - local and quality assured, a family owned, Utah company since 1894.